Looking for more clarity? Improved memory? Want to make better decisions with focus and confidence? Meet VOXX socks, insoles and patches designed with your wellness in mind. VOXX uses Human Performance Technology (HPT) which is a wearable neurotechnology like eyeglasses that is embedded into insoles and a patch or woven into socks to help enhance human performance. Cognitively, it appears to be allowing for improved decision making, focus, short term/applicable and activatable memory – the peer reviewed, double blind studies are currently ongoing. City traffic or the beach? As Former Toronto Argonauts Athletic trainer and current Sports Therapy consultant to Voxx Life, Kevin Duguay coached me, “within seconds of wearing the tech, you are taken from driving your car in a snowstorm on a Friday afternoon in Toronto on Highway 401 in heavy traffic - to the beach”. Which scenario would you rather be in? Me? It’s a no-brainer… the beach! Suffering from painful debilitating conditions? We are still finding out everything that Voxx HPT can help with. Tremors, weakness, sense of feeling, mental wellness, coordination, balance, focus, and sleep can potentially be helped with VoxxHPT. The nervous system is in contact with the entire body, so tapping into the brainstem with Voxx technology is like tapping into a computer mainframe to organize and optimize it. It benefits the physiology of the body including the muscular, skeletal, cardiovascular, digestive, and endocrine systems. Therefore the list of conditions this may help is extensive as it works on whole body wellness. Everyone is unique and it will focus on the area most in need so there is no predicting which will be benefited first, as it depends on the body's innate wisdom to heal. When you improve (on average) balance by 31% (and in so doing reduce falls in seniors by 8 fold! ), increase power output by 22%, range of motion by 15 degrees, speed up recovery time and decrease pain as much as 90% in diabetic neuropathy and 98% in plantar fasciitis sufferers, no wonder 2 million people are wearing this affordable/portable revolutionary neurotechnology, 40,000 have contributed unsolicited video and written testimonials and there is a 1% return rate! Voxx HPT uses a pattern of neuro-receptor activation points that only need to touch at 1/1000th an inch of pressure to activate the proprioceptors and mechanoreceptors (the reset button) on the ball of the foot or forearm. This directly stimulates and activates the neurological potential to create a foundation of strength, endurance, stability and wellness to improve your day-to-day performance and quality of life. Voxx HPT is scientifically proven in independent testing to date to instantly and consistently improve performance by: reducing diabetic neuropathic and plantar fascial pain, improved posture, strength, endurance, stability, balance, range of motion, faster reaction times and reduced recovery time from exertion. Voxx HPT was developed following the analysis of over 10,000 peer reviewed, double-blind international neurological studies dating back as far as 1964. The VoxxHPT technology pattern is simply a code. When it touches the ball of your foot or forearm, it sends a signal to the brainstem to go into equilibrium or homeostasis. The moment this happens, you become stronger, more balanced, with increased range of motion and potentially improved wellness in areas needed most. Athletic (4 heights), hiking, non-slip, dress, diabetic, mild compression and liner socks available. Three thick insoles: Athletic, Classic and Bliss as well as a thin insole (Bella/Bello) available. Your experience of life depends on the health of your nervous system. Voxx HPT has found the “Control Alt Delete” button on the ball of our foot (and forearm) to set our body’s computer back to its factory setting – in this case, by putting the brainstem into equilibrium or homeostasis. It seems like magic, but it is scientifically backed with leading neuroscientists currently excited about the possibilities. The effects have been proven beyond any placebo effect. You will want to sleep in these socks. I first got “Voxxed” in May 2018. I was impressed with the increase in my stability but what was remarkable was the increase in my range of motion upon doing a standing twist. My two “Voxxers” (Laura and Verna) were literally stunned as it was well beyond the average 15 degrees and the most they had ever seen. I remarked that it was so surprising considering I have been suffering with such a limited range of motion with a frozen shoulder for 2 years. I even demonstrated the restriction in how far my hand could lift behind my back in internal rotation. Just for curiosity, Laura asked me to step again on the Voxx insoles. When I did, I immediately had full range – my fingers were touching my shoulder blade! When I stood off the insoles, my limited movement was back. A couple weeks later I bought some Voxx socks and wore them when I could (including to bed at night!) Its 6 weeks later now and I have full range of that shoulder – with or without the socks on. It seems to have had a lasting effect and I am thrilled! VOXX Human Performance Technology (HPT) is based on 45 YEARS of research in Neuromuscular Science. It is a proprietary pattern of neuro-receptor activation points where you can achieve instant and drug free wellness and performance. Voxx is safe for individuals. Right now in the health and wellness industry there is constant promotion of products with various side effects or warnings for safety. Individuals are looking for products that will enhance their quality of life, yet are also natural and safe. Voxx is a natural and safe product. There are not side effects or safety warnings, just side benefits and increased qualify of life! The documented results and benefits arising from the products incorporating the VOXX HPT pattern include enhanced pain relief and management, especially Painful Diabetic Neuropathy (PDN) pain, enhanced postural stability and balance, and improved mobility and overall energy levels. Learn more about the benefits of the Voxx HPT technology. Customers have reported that Voxx socks & insoles have impacted them in a positive way with brain injuries, MS, Parkinson’s, Migraines, Arthritis of all kinds, sciatic pain, foot pain, Restless Legs Syndrome, Leg cramps, and much more. Check out the Testimonials page to learn more about how customers are improving their quality of life, wellness and performance by using the Voxx socks and insoles with HPT technology. The Voxx Stasis Athletic socks were designed for sports or for those that like a snug fitting sock around their foot. The Voxx Wellness sock is a great every-day sock for casual or office wear. It has a less snug fit than the Athletic socks and it is thicker for added comfort. Many prefer this sock for swollen legs or ankles or those with diabetic neuropathy (PDN). Voxx Bliss (Blue) – Extra thick for added comfort. Great for folks who are on their feet all day long. Voxx Classic (Orange) – A balance between the Bliss and Rush models. A great all-around insole. (Our only insole available in an XL size option). Bella (women)/Bello (men) – A thin ( 5 mm) for tighter fitting shoes. If you are pleased with the results of your orthotics, then simply try Voxx socks with them. If you are looking to replace your orthotics, you may want to consider trying our Voxx insoles (much more affordable than orthotics!). They may be all you need. Where do I apply the Harmony Dermal NeuroPatch? The first time you wear the Harmony Dermal NeuroPatch it must be applied on the inner forearm of your dominate arm (the arm of the hand you write with). After you wear the NeuroPatch for 1 day, you can then wear the patch anywhere on the body and it will have the same impact. To further understand this technology, visit the Product Page. Does Voxx have kid socks? Beginning in May 2018, Voxx will offer the Athletic Mini-Crew style in size XS. For more information, visit the Product Page. 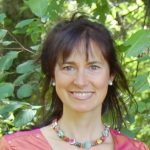 I am a Registered Holistic Nutritionist, Massage Therapist, and Energy Healing practitioner and I see my role as kick-starting people’s health transformation. I believe that the natural state of the body is the healthy state and that it is always healing itself. It is my passion to empower my clients to take charge of their own health by functionally moving, nutritionally eating, and cultivating mindfulness to remain healthy.